A successful trade show hinges upon efficient logistics planning. When you’ve invested substantial capital into putting on an event, the last thing you want is to arrive at the show only to discover that deliveries missed the receiving deadline, or your marketing material was damaged on route. Trade show logistics play a crucial role in delivering a successful event experience. And whether you’re putting on a trade show, promotional event, B2B expo, or pop-up retail extravaganza, organizing a large-scale event is no simple matter. Because there’s so much at stake, large scale trade shows pretty much have to operate on the assumption of strict deadlines. All too often, marketing planning overshadows the need for smart logistics planning. And we get it, making sure you nail your company’s marketing message is incredibly important. That’s why letting AFP Expo Logistics handle your trade show logistics is so valuable. Our highly skilled logistics specialists make the planning process easy and stress free, so you can devote more of your time to crafting the perfect presentation. Another thing about trade shows that often goes overlooked is the fact that tradeshow and exhibition logistics are unlike that of freight and transportation processes. 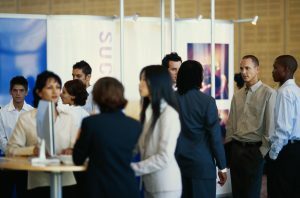 Trade shows have their own unique set of needs due to variable shipment sizes, packaging differences, multiple locations, time sensitivity and deadlines. It’s imperative to have a specialist with in-depth knowledge of on-site material handling procedures and rules. With AFP Expo Logistics, you can rest assured that convention material will be stored and delivered on time. We stand by our no-fail reputation for trade show and freight forwarding expertise. That way, you can have peace of mind and focus on everything else you need to put on a successful trade show booth. For the highest-quality logistics handling experience that will be customized to the unique needs of your business, AFP Expo Logistics is the best and only choice! We offer a comprehensive range of shipping services, and our 25 years of experience in the business have given us the tools we need to create personalized logistic solutions for each and every individual customer. For more information or to start designing your own logistic solutions today, get in touch with AFP Global Logistics at 410.590.1234 (toll-free 800.274.1237), email us at expo@afplus.com, or fill out our quick and easy contact form here! This entry was posted on Thursday, December 8th, 2016	at 11:07 am	and is filed under AFP Expo	. You can follow any responses to this entry through the RSS 2.0	feed. Both comments and pings are currently closed.